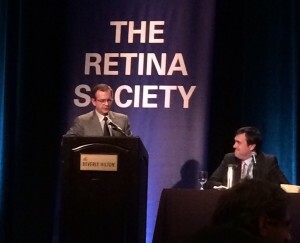 Dr. Sebag attended the annual Retina Society Meeting this year held at the Beverly Hilton in Beverly Hills, California. Although the debate regarding whether or not floaters constitutes a large enough nuisance to call for surgical intervention is ongoing, Dr. Sebag met with astoundingly positive reactions from his audience. While many people have floaters, some have heightened degrees, even still most doctors are unwilling to accept it as a disease and, therefore, are reluctant to treat it. VMR Institute has developed a 5 – 10 minute, minimally-invasive approach that has proven effective (by testing contrast sensitivity before and after) and, more importantly, safe. We are proud to say that we are currently the only ones to have proven Vitrectomy for Floaters an effective treatment. Our mission is to bring awareness to the medical community about the seriousness of this disease, and the need for treatment. According to our patients, floaters can be debilitating and we are determined to help.